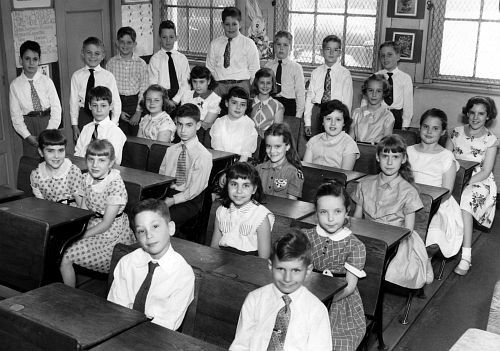 A Picture History of Kew Gardens, NY - Class Pictures - Class 3-1 - 1954. Thanks to Lynn Silverstein for identifying some of the students. Jimmy Lane, Ronald Pringle, Michael Gruenberg, ?, Melvin Perlmutter, Norman Graewe, Malcolm Mallory,* Charles Newman. Cynthia Lief, Robert Eisenstein, Jane Berry, Lynn Silverstein. Erica Lief, Bill Lehman, Marjorie Singer, Andrea ?. Andy Edelson, Jeanne Shumacher, ?, Karen Mazarsky, Anne Rolle. Please email me if you can fill in any of the incomplete names.